Spring is here and it's our favourite time to bike as a family. Trails are still muddy and wet but many highways and campground roads in Kananaskis are clear, dry, AND free of all traffic! Now is the time to enjoy safe road rides with the kids on balance bikes, training wheels, tricycles, scooters... - you name it. The roads are ours! This is our favourite bike ride each spring and the scenery is spectacular in the park. There's a playground in the Elk Flats Group campground en route to the Many Springs Trail. We like to stop here for lunch/snacks and some play time. The Middle Lake area also has a nice walking trail around it and is pleasant to explore. To see more photos, read the story I wrote last spring: The Bow Valley Biker Gang. Highway riding with kids was never so easy! Drive out to Bragg Creek to highway 66. Park above the Elbow Falls Day Use Area on the side of the highway at the winter gate which doesn't open until May 15th. Until then, the highway and surrounding campgrounds are wide open for cyclists - and CLOSED to all cars. Wahoo! Here's another Elbow Valley campground that's fun to bike around before it opens on May 15th. Park at the closed Paddy's Flat Campground gate along the side of Hwy 66. From there, bike down into the campground and head for the playground or the river. There's a fun interpretive trail that follows the river and is fun for kids to bike. Again, it is a hiking trail so take it easy on the adult bikes! Or walk. Note as well that there may still be some flood damage to this trail. It might not be feasible to bike the entire trail. Regardless, it's a fun little hike and you can still bike the campground roads to access the interpretive trail. The Elkwood Campground doesn't open until May 14th and can be fun to bike around without threat of traffic hitting beginner bikers. From this campground, you can access the Marl Lake trailhead which is a 1.5km loop and super easy. Kids could loop it on balance bikes and it's chariot friendly. Again for adults on bikes, it is technically a hiking trail so maybe lock up the bikes before heading out on it. This is not easy campground cruising, but an outing for families with older children and teens that can handle some steep hills and pedal with sustained energy. Highway 40 is closed past the entrance to Peter Lougheed Provincial Park until June 15th each year. This gives cyclists a rare opportunity to bike to Highwood Pass and back in a heart pounding 30km return trip ride. While this is going to be way too much for most families, you don’t have to go the whole way to the Pass. Ride as far as you have energy for, have lunch, and enjoy the fact that you got to share an empty highway with nobody but other cyclists for a day. Strong cycling families with younger children could also do this ride with a Chariot or bike trailer for a nice spring outing. It’s great training for bigger adventures you might have planned in the summer. Park at the closed gate along the side of Hwy 40 for this trip and keep your eyes peeled for wildlife. Herds of big horned sheep are frequently sited here. Note, it is advised to carry bear spray with you as Highwood Pass is a popular area for grizzly bears in summer. For more information on cycling to Highwood Pass visit this link to read a good description of the journey. Also check out my other story on the Best Family Bike Trails in Kananaskis for plenty of great mountain biking options. Troll Falls is a family favourite along with the trail to Watridge Lake. These trails should all be in condition by early to mid June. Did I miss any? What's your fav. trail near Calgary?? Thanks for your post, we took your advice and went to Highway 66 today. We parked up at the barrier that closed the road - there were a lot of cars there, but most people seemed to be visiting the Falls. 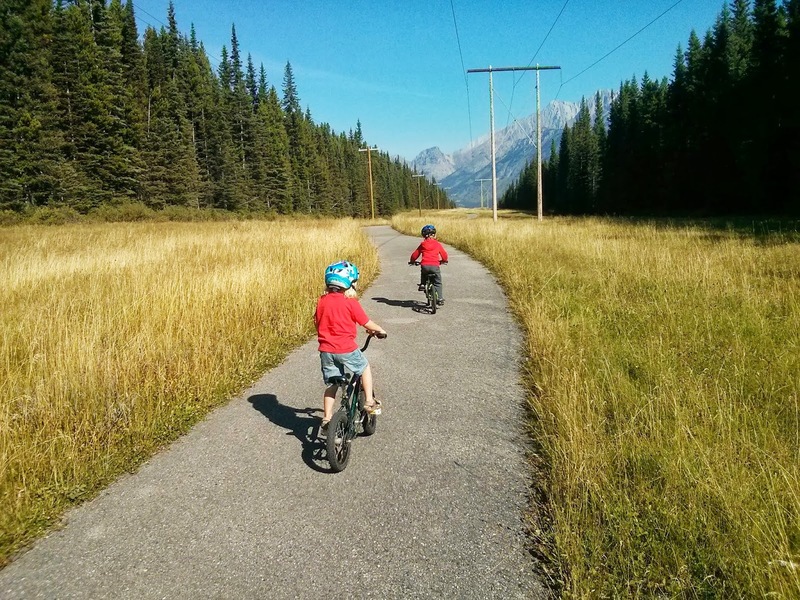 We cycled with our kids (6 years and 2 years) along the closed part of the road as far as Beaver Flats campground, then cycled round the campground, pausing to play by the river for a while, before heading back to the car. We'd seen a moose by the side of the road just after the Elbow Valley bridge (currently still being repaired and is traffic-light controlled), and there was a group of mule deer down by the road-closed barrier where the cars were parked. Thanks Chris for sharing your story. Glad you had a great trip. We love this bike/hike combo trip every spring. I'll check out your photos. This is great post.I like this post. Many many thanks for this post.Really this post is so helpful for the kids balance bike .